The Trionic Veloped Trek is a new take on the standard wheeled walker that allows you to enjoy life to its fullest. Fully equipped for hiking and traveling, it can pass over all types of uneven terrain easily. 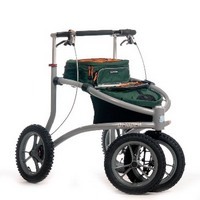 Its smart wheel suspension, large air filled tires, and built in seat make walking with the Veloped easy and comfortable, and you can stop to sit down and rest any time. (This item requires special shipping considerations because it is too big to be shipped via UPS. Please contact MonTECH before checking out item.) To find this item, search for equipment in MATP.